Preserving historic artisanship is one of our main goals. During the manufacturing of our products, the crafts­people use historic tools and authentic procedures whenever pos­sible. Our products are made of the finest available quality. 90% of the pro­ducts are hand-made from solid Sand-Cast Aluminum. 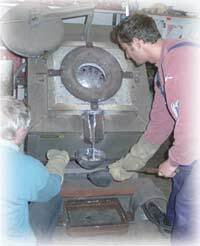 This method of casting is the original and historic way. The molds are pressed in special sand which is then filled with liquid aluminum. This process guarantees an authentic look and feel of the product. 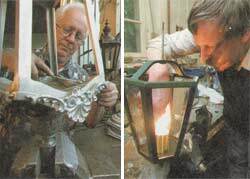 Through this method we are able to achieve a slightly imperfect product surface which gives the lanterns, mailboxes and other products their historic look. Because of the traditional ma­nu­fac­tu­ring, our products are of substantial weight. They feel solid and heavy and are “made for eternity”. We are proud to offer a large variety of cus­to­mi­za­tion options. Since the manufacturing process and the casting of most of the products is traditional hand-work, we can satisfy most of our customer wishes – may it be color options (“different patina”), new designs (“mixed and matched” from original parts) or other requirements.